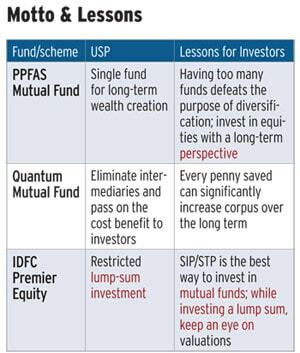 The fund house, which launched its only scheme, PPFAS Long Term Value Fund, in May 2013, believes "too many choices lead to decision paralysis and confuse investors." Hence, it intends to have only one "general value equity scheme." PPFAS Long Term Value Fund invests at least 65% money in domestic equities and the rest in bonds, money market securities and foreign equity markets. At the end of November, it had invested 67% funds in domestic shares, 27% in foreign ones and held the rest in deposits and cash. Even before Sebi banned entry load, an upfront commission paid to distributors, in 2009 or allowed direct investing in 2012, Quantum had allowed people to directly invest in its schemes, eliminating the need to pay distributors. "The direct route has helped us get a step closer to our investors and understand their pulse. By doing so we can take extra care of our investors, which gives us a loyal customer base," says Chief Executive Officer Jimmy Patel. No distribution cost means investors are charged less, which in the long term can result in a significant difference in the corpus. While the average expense ratio (annual charges deducted by funds from the net asset value of the scheme) of large-cap diversified equity funds as on October 31 was 2.5%, that of Quantum Long Term Equity was 1.25%. Similarly, Quantum Tax Saving's expense ratio is 1.25%, as against the category average of 2.5%. This (1.25%) is lower than the average expense ratio (1.6%) of direct plans. In direct plans, investors can buy units directly, without involving an intermediary. But opting for a direct model comes with a price. Many fund houses that launched much later have surpassed Quantum in terms of AUM. At the end of the September quarter, Quantum had an AUM of Rs 509 crore compared to Rs 479 crore of PPFAS Mutual Fund, which began operations only last year. This despite the fact that Quantum Long Term Equity Fund is one of the best performing funds in its category. Its AUM was Rs 360 crore on September 30. "The only challenge is to maximise your reach. The distribution model may let you reach every corner of the country without a physical branch. However, to compensate, we have an interactive and quality website that allows one to invest without paperwork. Also, we have a strong sales team that reaches out to investors via phone or personally and helps them," says Patel. The fund house has eight schemes. All of them are for retail investors. It has only one debt scheme--a liquid fund. This is another reason for lower assets. 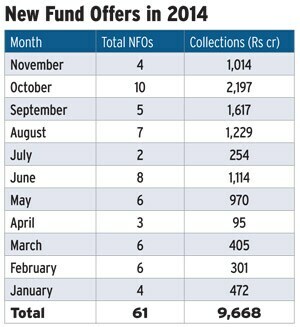 Debt and money market funds account for 67% of the industry's total AUM (Rs 9.6 lakh crore as on September 30). Quantum's liquid fund accounts for only Rs 70 crore, or 13%, AUM. Though the direct strategy is welcomed by some, many believe that Quantum's approach can work in a market where investors are highly aware and savvy. "In India, where only 4% household savings go into mutual funds, and there is a deep-seated fear of investing in equities, investors need hand-holding and advisory services. A direct approach, therefore, will not work in the long term," says Tanwir Alam, founder and CEO, Fincart, a financial planning company. IDFC Premier Equity fund, a mid- and small-cap fund, restricts lump-sum investing (though there's no restriction on systematic investment). This has worked well for the fund. The idea behind accepting lump-sum money for specific periods is to ensure that the new money is invested in stocks only when they are available at 'reasonable valuations'. The SID of the fund clearly mentions this. "The fund will close subscription once it has collected a predetermined 'manageable' corpus, which will be decided by the fund manager depending on the investment opportunities in the stock market or if the fund manager is of the opinion that investment opportunities have diminished," reads the document. Kalpen Parekh, CEO, IDFC Mutual Fund, was more than eager to elaborate the idea. He pulled out a sheet called 'Traffic Light', a line chart of Sensex levels since 1999. The area in the chart between the trend line and the X-axis was divided into red, green and yellow zones. The green zones were periods during which the Sensex was trading below the 12-month trailing P/E of 16, the yellow zone was the period during which the P/E was in the 16-19 range and the red zone was when the P/E crossed 19. The green zone signifies low valuations, yellow shows fair/moderate valuations and red zone signifies that the market is expensive. 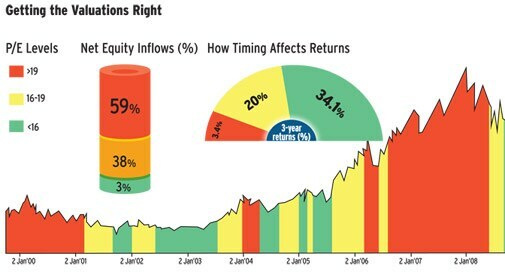 "What we have seen is that investments come mostly when the P/E is in the red zone and redemptions happen when the P/E is in the green zone. Ideally, the reverse should happen," says Parekh, adding that the fund accepts lump-sum investments only when the market P/E is in the green or yellow zone. 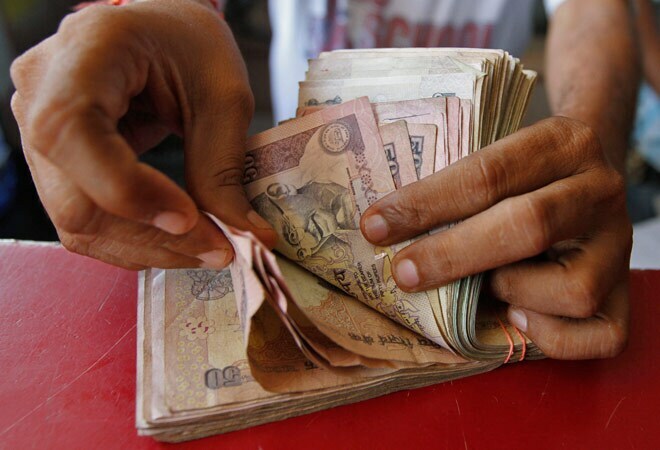 This year the scheme started accepting lump-sum money on 27 May. It was closed in September 2014. There is another reason for the strategy. Since it is small- and mid-cap fund, a large inflow may not get allocated in the right stocks at right valuations. This will force the scheme to dilute its mandate and invest in large-cap stocks. It anyway had close to 21% funds in large-cap stocks at October-end. The scheme had an AUM of Rs 6,400 crore on October 31.